'Netflix Download' is one of the most search keyword combinations today, a clear sign that the decision this week by the US company to allow the download of movies and TV series for offline mode will be one of the most appreciated by subscribers to the streaming service. Because since last November 30, you can download part of the content available in the catalog of Netflix and watch it at a later date, depending on the needs of the user. In this regard, some questions arise, such as: how long will it take to download Netflix content, and how much space will occupy in the internal memory of our iPhone or Android device? Let's try to answer these questions. 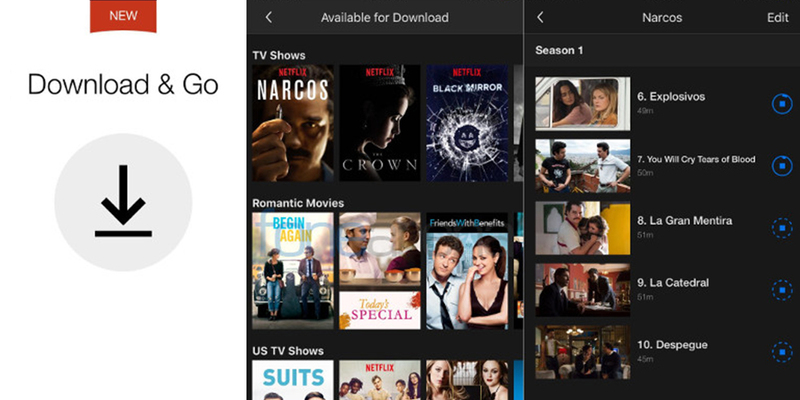 The functionality that now allows us to download all the content of the catalog to watch without connection to the internet, called 'Download & Go', is currently limited to mobile devices, either through the official app of Netflix for Android or for iOS. If you download the app from the Play Store or App Store on your device, you can check that there is a new icon to download online. Needless to say, unless it is strictly necessary, downloading any 'downloadable' Netflix content, even the smallest one, will involve a considerable expenditure of mobile data (for now the plans offered by operators do not provide a great deal in terms of GB). Much better, even for speed, to download when we are connected to a Wi-Fi network. That said, we will move to the space occupied by Netflix downloads on iPhone and Android devices. Let's start by saying that we immediately notice a difference (significant, but not substantial) between the two platforms: the first seems to require more data than the second. It also specifies that Netflix download modes are two, 'standard' and 'HD'. As the terms suggest, in the first case, the quality will be lower, as will the weight of the film or the episode to be downloaded. With the superior quality option, episode 1 of the series 'Stranger Things' weighs 310 MB (iPhone) and 260 MB (Android), which become 237 and 197.1 MB, respectively, in standard mode. Whereas if we want to take as an example a movie, 'John Wick' has a weight of 1,005.8 MB (iPhone) and 910 MB (Android) to the highest quality, and 486.1 and 448 MB in the normal version.